"Watch the kids. Do like they do. Act like they act. Yell like they yell. Dance the ways you see them dance. Sing like they sing. Work and rest the way the kids do. You'll be healthier. You'll feel wealthier. You'll talk wiser. You'll go higher, do better, and live longer here amongst us if you'll just only jump in here and swim around in these songs and do like the kids do. I don't want the kids to be grownup. I want to see the grown folks be kids." 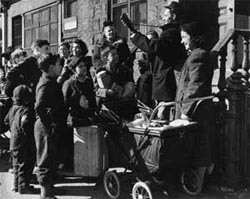 Following the war, in 1946, Woody Guthrie returned to settle in Coney Island, New York, with his wife Marjorie and their children. The peace he had fought so hard for seemed finally within his reach. It was during this time that Woody composed and recorded Songs to Grow On For Mother and Child and Work Songs To Grow On, considered children's classics which won him success and recognition as an innovative writer of children’s songs. Woody’s unique approach was to write songs that dealt with topics important to children written in language used by children such as; friendship (“Don’t You Push Me Down”), family (“Ship In The Sky”), community (“Howdi Doo”), chores (“Pick It Up”), personal responsibility (“Cleano”) and just plain fun (“Riding In My Car”). Toward the late 1940s, Woody’s behavior started to become increasingly erratic, moody and violent, creating tensions in his personal and professional life. He was beginning to show symptoms of a rare, neurological disease, Huntington's Chorea, a hereditary, degenerative disease that gradually and eventually robbed him of his health, talents and abilities. At the time, little was known about Huntington’s Chorea. It was later discovered to be the same disease which thirty years earlier had caused his mother's institutionalization and eventual death. Shaken by inexplicable volatile physical and emotional symptoms, Woody left his family once again, taking off for California with his young protégé, Ramblin' Jack Elliott. Arriving at his friend Will Geer’s property, Woody met Anneke Van Kirk, a young woman who became his third wife and with whom they had a daughter, Lorina.